*You can learn to trust yourself and your child around food. That may feel impossible when you worry that she won’t eat enough or hasn’t progressed in months or years, and that things may even be getting worse. 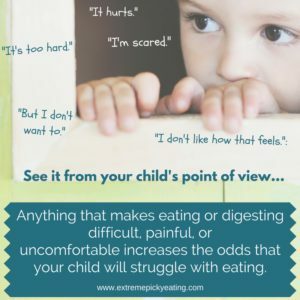 Understanding what is typical, what isn’t and the many factors that can contribute to extreme picky eating (EPE) will help you decide what you can let go, what you can work on to support your child’s eating, and above all, how to not make matters worse. Contributing medical issues must be ruled out or addressed. These might include allergies, reflux, or severe constipation—basically anything that can cause pain or make a child feel poorly. Young children can’t generally identify what doesn’t feel right, but they know it’s difficult or painful, and their feeding behaviors are driven by avoiding negative feelings. Any physical issue that makes it hard to get food to the mouth, chew, breathe, swallow, or sit upright impacts eating. Anatomical problems like a cleft palate, breathing or swallowing tube malformations, dental issues, tongue tie, muscle weakness (low tone), or even enlarged adenoids and tonsils can play a role. 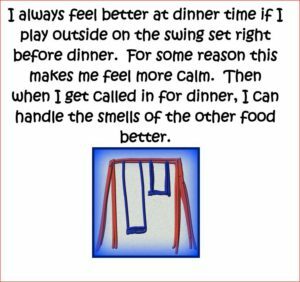 Children with sensory integration challenges process sensory input differently. Tastes and textures can feel too intense, or awareness of food can be poor, leading to indifference or to pocketing (food tucked in the cheeks) because the child can’t sense that the food is there. Some children with sensory challenges eat only smooth or crunchy foods with uniform texture. (The tendency to reject mixed foods is also seen in typically developing toddlers.) If your child eats different textures (including for example yogurt, pretzels, cucumber slices with the peel, and watermelon versus only purees), major sensory or oral motor problems are less likely. 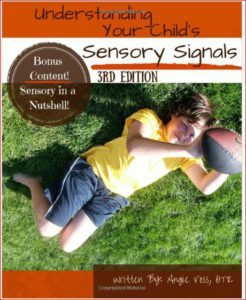 Angie’s book, Understanding Your Child’s Sensory Signals is a reference to understanding what your child may be experiencing. Examples are “Always Slams Doors and Cabinets” or “Presses Hands and Feet Against Other People”, with brief sensory explanations and ideas on how to help that parents can implement right away. It is quick, practical advice condensed and easy-to-use. Join us on Facebook for details on a give-away for Angie Voss’ book! Angie’s book, Allie Only Eats Three Foods addresses selective eating (that we include under the ‘extreme picky eating’ umbrella) as it relates to the sensory experience. Parents can read this on their own to understand the child’s experience, or perhaps read with an older child or share with a grandparent who is having a hard time understanding. (For handouts and more check out Angie’s website and facebook page). Many of our clients describe their children similarly: highly verbal and intelligent; having a strong desire to figure things out in their own time and their own way; easily upset and frustrated; and feeling and expressing intense emotions. Many neurotypical children with EPE exhibit an independent nature (determined and not wanting to lose) or are very tuned in to a parent’s agenda and pressure, resulting in increased anxiety. Food refusal has been linked to temperament traits including shyness, emotionality, and irritability. When acting on his desire to eat (appetite) has resulted in an uncomfortable or scary sensation, a child’s appetite is decreased. 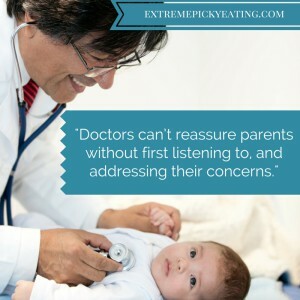 Aversive experiences can happen in typically eating children– a choking episode can trigger a fear of choking to the point where she stops eating and drops weight quickly. Oral surgeries or history of breathing or nasal feeding tubes (negative experiences involving the mouth) can also make children avoid eating and even drinking. A child who has experienced coercive or forced feeding may develop an extreme fear that exacerbates initial challenges. One mom tearfully described how she put her son in a headlock to get the first bite in during a therapy protocol meal in his highchair: he was crying, she was crying, and from then on he screamed every time he saw the highchair and his intake decreased. Some children have more than one challenge. Everything gets mixed together. Infants who don’t mouth objects due to sensory problems are less likely to develop refined oral motor skills. If Jenny had a dollar for each parent who said her child never mouthed objects an as infant, she would be rich! Conversely, oral motor problems can lead to sensory issues. When a child is born with oral motor weakness (for example, a child with Down syndrome and low muscle tone), the muscles in the cheeks, lips, and jaw don’t function appropriately, so the nerve endings aren’t properly activated. The sensory and motor systems go hand in hand: if the sensory system doesn’t alert the motor system that it’s time to chew, small pieces of food may slip back in the child’s mouth before he’s ready to swallow. He may overstuff his mouth seeking sensory input, or gag or vomit frequently, which feels bad and lowers appetite. Add a child’s cautious temperament or desire to do it his way, as well as a parent’s reactions and frustrations, and you can see how hard it is to tease out causative factors! The good news is that with some understanding and support, and with strategies that allow you to respond to your child’s cues and facilitate progress, you can begin to help him grown confident and competent with eating, to the best of his abilities. Alexa, mother of a child with severe sensory challenges, notes: “Amy is almost twelve, and in the last year we have seen incredible improvements in the variety she eats.” Progress may come quickly, or less so. At first progress is often increased comfort and decreased anxiety, maybe eating more of a favored food, and later variety improves. Understanding a child’s challenges and responding sensitively is the foundation. 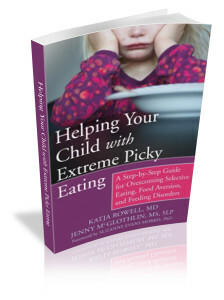 *Portions of this post are excerpted from chapter 2 in our book, Helping Your Child with Extreme Picky Eating. Brief introduction to our STEPs+approach to extreme picky eating.